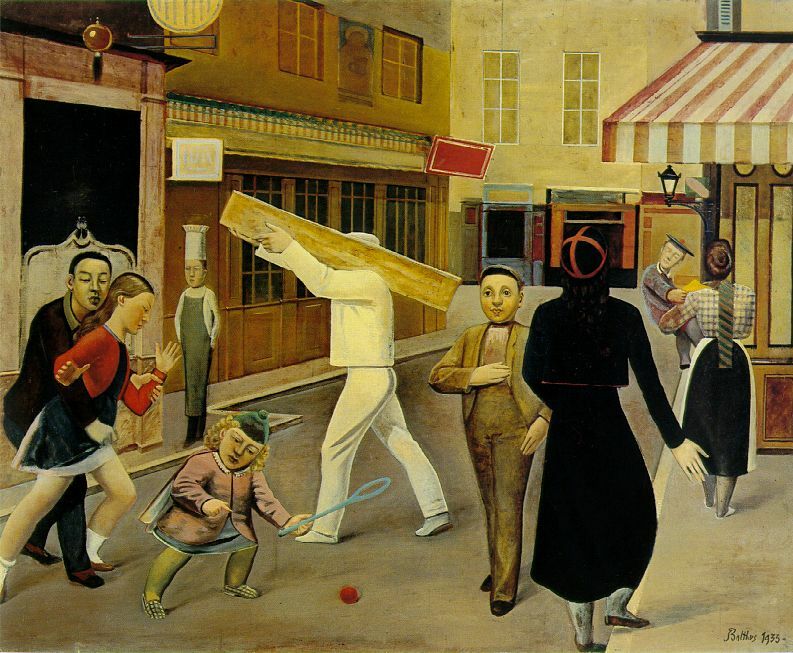 Infinite Art Tournament: The Infinite Art Tournament, Left Bracket Round 2: Avercamp v. Balthus! Avercamp destroys here for me. 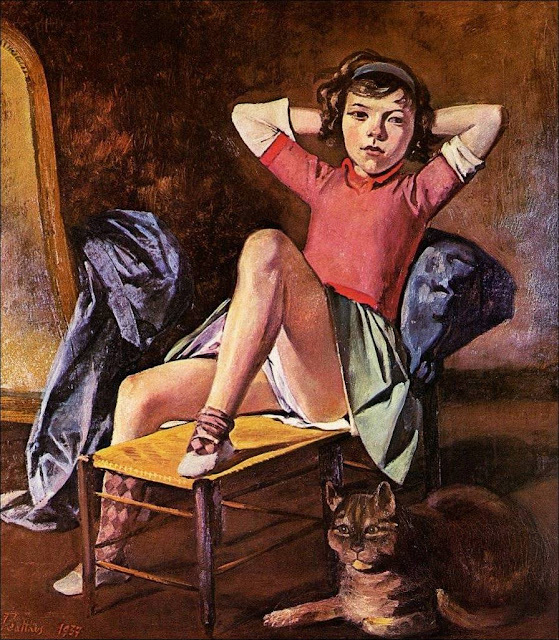 Outside of Balthus' third one, I am not a fan. Although I do wonder, what did Avercamp do with himself during the Spring and Summer? Avercamp all the way. Awesome trees. Balthus is kind of creepy … Avercamp by default. I vote Avercamp! 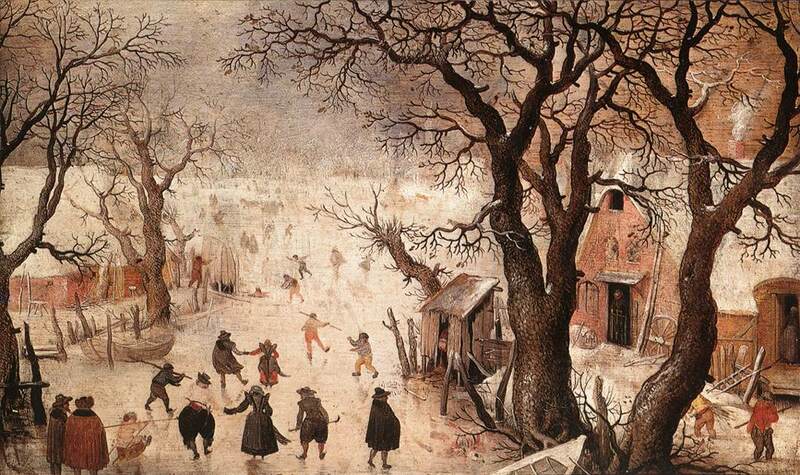 I like the trees, the detail, and the crowds of people doing interesting things. 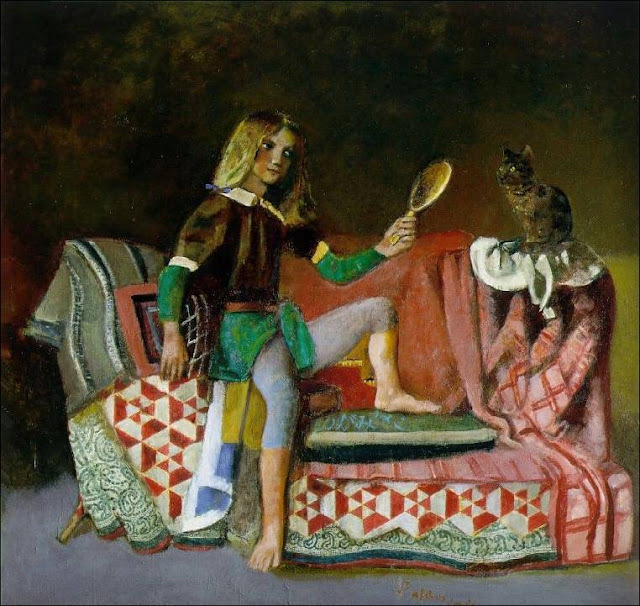 I did like the cat in Balthus painting one. One vote per participant, Morgan. I like the Avercamps quite a lot, lots of people looking very natural and no one of any real importance, but the Balthuses--stiff and creepy though they are--are far more interesting. They seem to suggest any number of narratives, and are poised in a very specific moment--whereas, with Avercamp? Yeah, that's pretty much how it looks out there all winter. Purty, ain't it? I'll throw in with Balthus. Is Avercamp about to recollide with Bacon again? Michael "Remembers When ChuckDaddy Thought This Whole Thing Was a Terrible Idea" 5000 has also noticed that Avercamp/Bacon might well turn out to be the tournament's first grudge match. Michael, based on my new experience I can subjectively say that phone-based web-browsing is not the best platform for IAT votes. Avercamp is on list of favorites, although as the Tournament goes on I'm starting to worry a little about a certain lack of range. In a way, looking at Balthus has been one of the most enlightening aspects of this venture for me. I dislike him very much, and I do not expect this to change. I have had to get my mind around others seeing an intentionally skewed representation of the world, instead of what it looks like to me: paintings by an untalented hobbiest. The only time I've considered shutting the tournament down is when I saw people voting for Balthus in Round 1; I honestly thought "These people are deliberating sabotaging my experiment!" But, although I will continue to hope for his decline and fall from the tournament, I feel like I've grown in the sense that although I still don't see any merit, I'm at least looking for merit. If that makes any sense. My vote is for Avercamp. I'mma be goin' with the crowd and voting Avercamp, too! I maybe see what you mean about the range, if they're all in this vein, but I'm still crushing on Avercamp. P.S. Did you think about Avercamp actually painting these pictures? When I imagine how cold it has to be to freeze a river solid, and then think about the kind of clothing they had available, and how hard it is to do anything when your fingers are numb, and how hard it is to capture motion, and how difficult it would have been to make sure the paints worked properly in the cold and all... then I start wondering whether he just stayed inside and used his imagination rather than hanging out on a frozen riverbank, painting. But I still love 'em. Generally, rivers take a while to freeze and take a while to thaw. 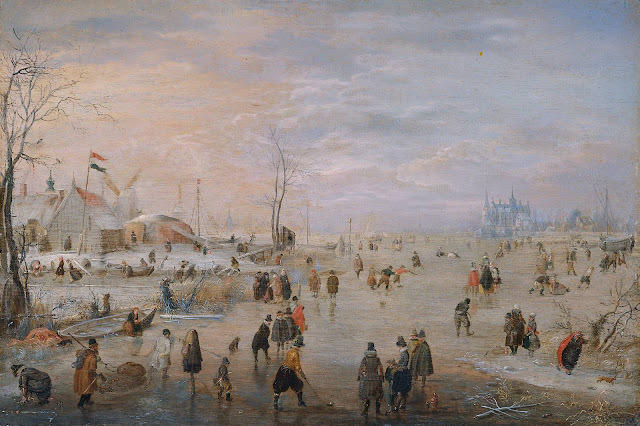 So, on a mild winter day -- the kind of day that would tempt skaters out into the plein air -- the temperature might be quite moderate, while the river remained comfortably frozen. Too, the Netherlands was probably the wealthiest area in the world at the time, and my educated guess would be that most folks in an Avercamp painting had winter clothing every bit as effective (if perhaps not quite as comfy) as the modern stuff. 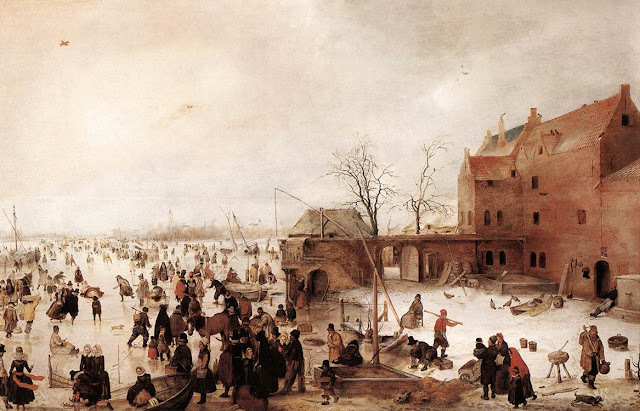 Having said that, I believe it was the near-universal practice of the Netherlandish masters to sketch from nature but to do the actual painting in the studio, where the raw materials were on hand and the apprentices available for gruntwork. And the victory goes to Avercamp, 10-3 -- a frosty, ice-skating mile!